St. George is coming to Sedgley! On Saturday 26th April the St. George’s Day Pageant, organised by Dudley MBC, will be held in Sedgley. A parade through the village centre will feature St. George on his charger followed by a dragon created and operated by local children. The procession will include the Mayor (Councillor David Stanley), uniformed organisations and a band. The festivities will continue in Vicar Street Gardens with singing, dancing, drama and medieval entertainment. The action begins at 11am with St. George leading the way from Mill Bank, through the Bull Ring and up Dudley Street to Vicar Street and The Priory. Here the Gardens will be packed with continuous entertainment until 3pm. All Saints Church are arranging an exhibition of parish history and the story of St. George while St. Andrew's Church in Bilston Street restage last autumn's exhibition celebrating their building's 150th anniversary. Sedgley Community Centre is opening to provide refreshments throughout the day and next door Sedgley Library offer a range of activities. Finally, it is expected many shops will join in the celebration with decorations and window displays. At a March ceremony to mark the presentation of the four 2008 Civic Awards, the Society’s founder member received the Thomas Attwood award for education. Trevor Genge’s citation noted his outstanding contribution through countless talks, presentations and many publications. This was a richly deserved recognition for many years working in the field of education as a teacher and renowned local historian. He was given a plaque and an exclusive hand crafted glass vase. 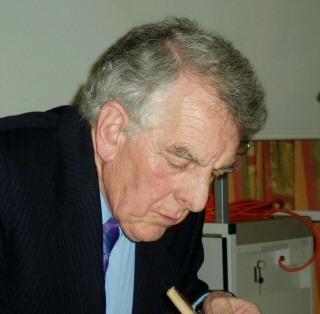 The photograph shows Trevor signing copies of his book, Sedgley & District - A Fifth Selection, at Queen Victoria Primary School in May 2004.